U. S. Army veteran Dennis Beauregard looks into the courtyard through a window in the spacious lobby. Beauregard, 64, lived in the VA Center in Clinton before moving to his new home. Guests joined family members who accompanied residents on opening day of a new residential care center for homeless veterans on Thursday, Nov. 15, 2018. The facility, named Our Heroes Community Residential Care Facility, is located in the 900 block of NW 25. Photo by Jim Beckel, The Oklahoman. OKLAHOMA CITY (AP) – An Oklahoma City residential care facility for homeless veterans has indefinitely delayed its opening after its credentials were called into question. 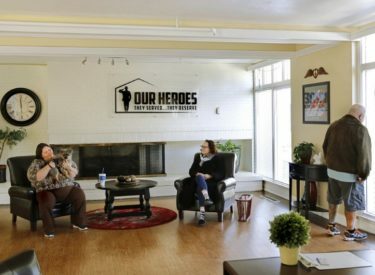 The Oklahoman reported Sunday that Our Heroes Residential Care Facility, which held an open house Nov. 15, claimed it was approved by the state’s Department of Veterans Affairs, was certified by the Oklahoma Department of Mental Health and Substance Abuse Services and had a pending license with the Oklahoma State Department of Health. But officials from those agencies said the facility hadn’t applied for or received the licenses or certifications. After state officials visited, facility administrator Tony Gammel said the center would seek the licenses and delay its opening. The center says it will house veterans who don’t require hospital or nursing care but cannot live alone.